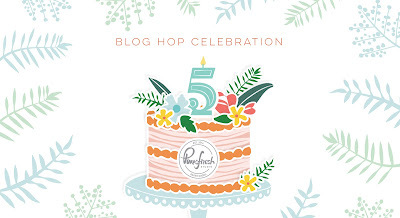 I'm so excited to be joining Pinkfresh Studio Birthday Blog Hop. Pinkfresh Studio is turning five and I've been their fan with capital F for almost just as long. 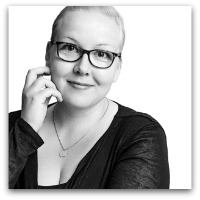 Big welcome for especially the ones who haven't meet me yet - Hi, I'm Terhi Koskinen addicted to scrapbooking! My personal journey with Pinkfresh Studio started through Hip Kit Club scrapbook kits, as there was some Pinkfresh Studio products (if my brains works well, it was Happy things line first) often included to the kits during the time I designed for Hip Kit Club. 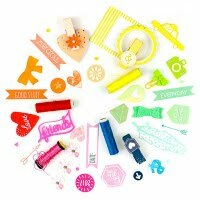 Then, as I loved the stuff so much, I asked if I could used Pinkfresh Studio products in my classes too - and sweet Kinnari behind the Pinkfresh Studio company said Yes! 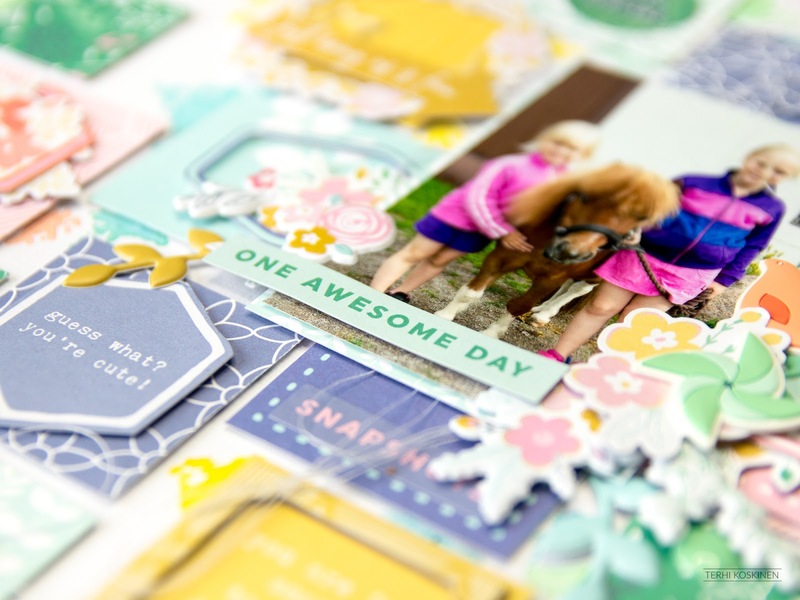 Including tons of Pinkfresh Studio goodies to my class kits has been always a huge success and I can't wait for the next time I'll be teaching again. I created a layout for this celebration using Joyful Day, and tried to keep things simple and pretty, because Pinkfresh Studio is like a synonym to words "simple" and "pretty" together. However keeping things simple, pretty and clean isn't always simple for me. After short period of actual thinking (rare, I know), I decided that as this layout is ending up to our family album, I can add just as much layers and details as I want to. I love to share happy things! right now! If you leave a comment here you can win a $25 giftcard to be used in Pinkfresh Studio Store! Yey! The winner will be announced on Sunday, April 14th on Pinkfresh Studio GIVEAWAY PAGE. The winner must check that page and claim the prize within 2 weeks. 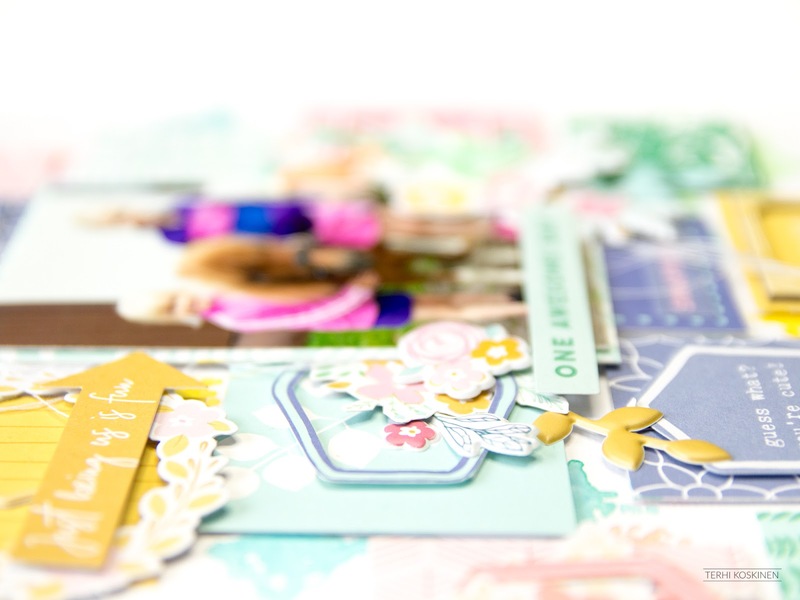 My mind is full of inspiration this kind of Blog Hop brings! Fortunately this weekend is devoted to scrapbooking (and long sleeps and chocolate), and I'd be happy to share some highlights of my days over at my Stories in Instagram - @terhi_koskinen. Thank you so much for joining me today here! And thank you Pinkfresh Studio for having me celebration with you! Oh and before I go, let's just say that this is a good time for shopping as there's two shopping promos during the celebration at Pinkfresh Studio. And another thing - check out this list and continue your journey (after leaving the comment here first). Such a COOL layout! I love all the layers! And darling girls! This is such a great layout. Love the frames and layers. Beautiful layout and I love all the colorful frames! Gorgeous job and so fun to look at! What a pretty layout. All the colors and layers and dimension are just the best!! You definitely kept it simple & pretty! I love this layout!! Loved your fresh take on a grid styled layout! 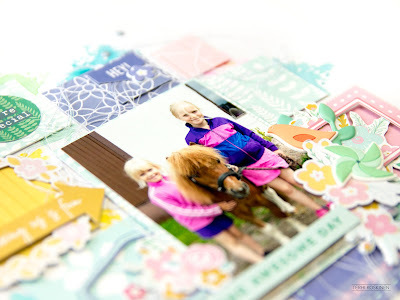 Lovely frames and adorable style....such a nice layout,thanks for sharing!! Lovely layout. You included so much interest and beauty into one page! TFS. Ahhh.... lots of beautiful paster-y color and lovely detail!! Oh lovely layers and blocks of colour! love the way you used the frames!!!!!! So many beautiful details - it's hard to know where to look next. Super cool layout. Love all the shapes you've used. Very sweet layout. I love the soft colors and the geometrics. Lovely! What a fun and colorful layout! Love it! Love the colorful layout! So pretty! Like all the shapes you used on your layout. What a fun layout! Love reading tidbits on the history of Pinkfresh! How cute!! I love the pony photo, and the soft colors in your layout. Fabulous layout. Love the colors. What a wonderful layout! So many amazing details! Beautiful patchwork of colorful squares! So many layers of beautiful detail! This is wonderful! So bright and upbeat! Fun layout! I love all the details! Oh my goodness!!! Great way to make a fun layout, love it!!! Such a brightful layout! Thanks for sharing! Love all the layers! Very pretty! Simple and oh so pretty! Very pretty layout. I love the pastel colors you used. Awesome colors and details! Beautiful page! What a gorgeous page! I love the geometric layout and color combo. 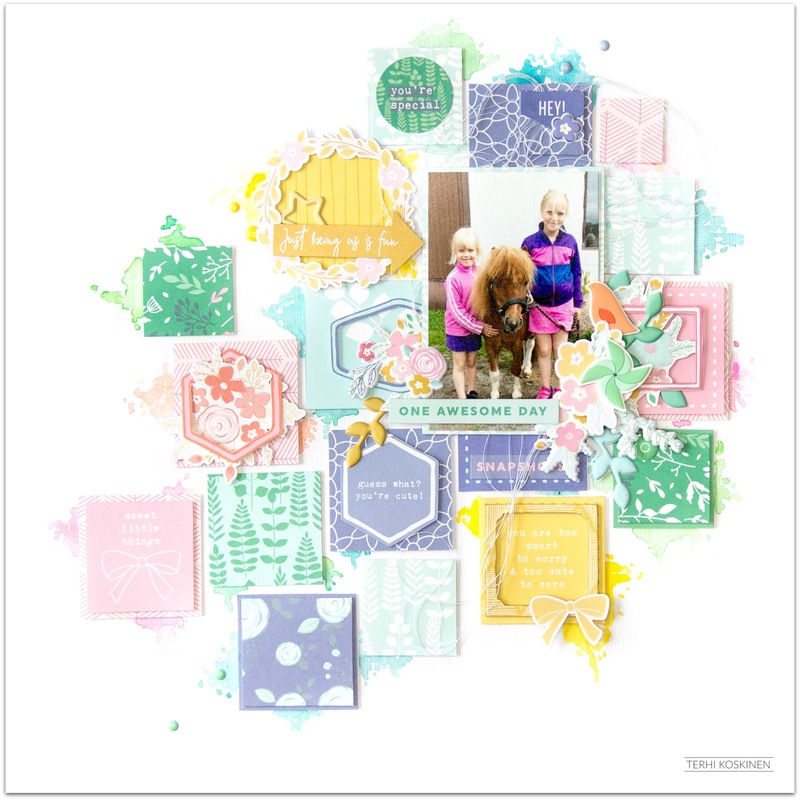 Great layout, so fun and cute, love the colors, thanks for sharing. Beautiful ... I might have to re-think scrapbooking! Lovely layout! Beautiful colors. Looking forward to checking out your instagram. Such a pretty layout. I love the colours and the embellishments add just the right amount of texture. Cute layout, love all the elements and the pop of yellow! 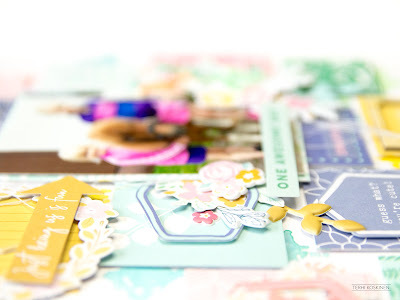 Love the fresh happy colours of your layout, and the design and dimension are fantastic! Thanks for the inspiration! Love your design and the photo is so sweet! Treasured memories! Great layout - the soft colour scheme you used is gorgeous. Thanks for sharing! So much goodness to look at in your layout! simple. . .clean. . .AND A PONY!! how much better can you get??? Wonderful page! So many things to captivate your attention. Beautiful color choices. I love this layout. The colors you used are amazing. Love the details of your layout. Great use of the Pinkfresh Studio products. Wonderful job. Thanks for sharing your creativity! Simple yet pretty seems to be the magical words for Pinkfresh. Love your scrapbook page and this inspiring hop! Fantastic page! Love the colors and design! Very pretty layout, gorgeous design. I love all of the pretty spring colors Pink Fresh uses in this set. I love all the layouts and cards. So elegant. I'm always astonished at people who can layer a bunch of products without making their projects look cluttered. I love all the details of the paper and embellishments you used. I especially like how the pinks, purples, and blues are all lighter shades of the pinks, purples, and blues that your daughters are wearing. Such great coordination! Thanks for sharing with us. Pretty layout! The patterned papers are beautiful and look amazing cut and layered into the little squares. I like the puffy stickers in this collection also! Love this fun and colorful layout. 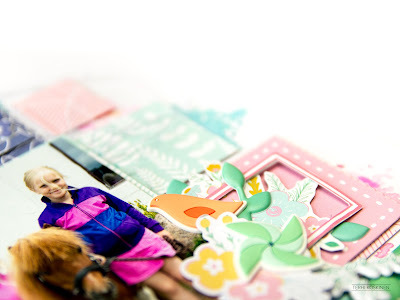 Love the collage grouping with the photo as the focus!! What a work of art! So very cool and a lot of time and effort. It shows. Perfect. This is such a sweet layout! Love the cute photo with perfectly matching colors in the background. Clever! Lovely! 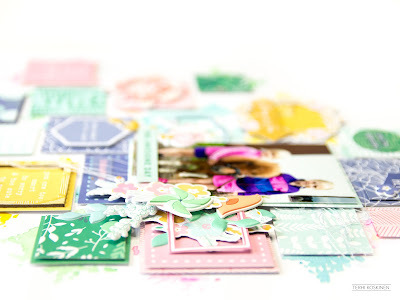 Such an inspiring way to use up pretty paper scraps too. How cute!!! Love the design and your cute photo! Your details are wonderful! This layout is so dreamy! It reminds me of soft cotton candy with its pastels and cheery manner. The kids and the mini horse are super cute too! Love the blocks of the pretty colors!! Such a wonderful LO!! Beautiful layout! What a sweet and fresh design, gorgeous colors. Ha! I love the sound of your weekend! Mine consists of children on Spring Break so unfortunately not a lot in the way of sleep here -- chocolate maybe. ;) Love your layout. luv all of the elements and it's not too busy! just right!! Love the mix of colors and all of the squares!